Home » Products » What Business Are You In? I have teamed up with Tim Downs, an old and dear friend, to launch a weekly 30-minute podcast focusing on the topic of Communication Skills. We have made this special teaching CD for those in the remarkable life changing industry of network marketing. 1: What business are you in? 3: Three communication blunders of network marketers. 4: The smart side of skillful communication. 5: Do you know what you sound like to others? 6: The six smelling salts. 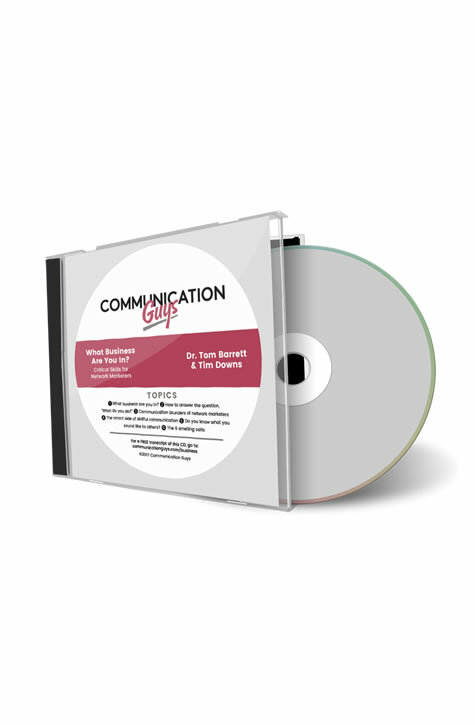 Our goal at Communication Guys is to teach life-changing principles of communication that are essential to all success, whether personal or professional. We plan to cover it all, from the boardroom to the bedroom—and we plan to have a lot of fun doing it!